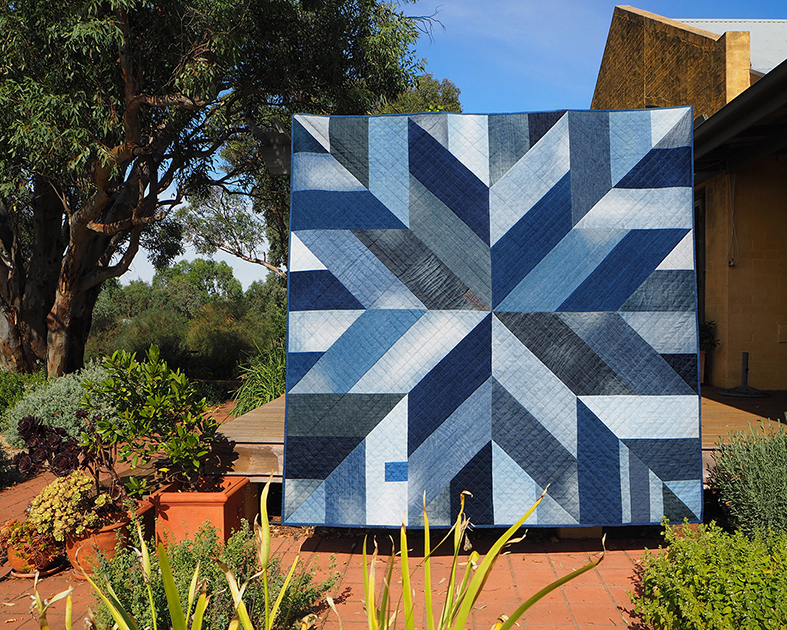 New year, new quilt – the Blue Giant quilt pattern! Introducing the Blue Giant! The pattern is available on both my Craftsy and Etsy pages. This quilt has been quietly plodding along in the background for well over a year now – but just as 2017 was getting underway I stitched the last stitch into the binding. Let's face it, a quilt top with pieces that big took no time at all to construct. It was the decision to hand quilt that dragged it out by months and months. I'm so glad I did it though, the larger stitches created with indigo-dyed sashiko thread really suit the aged and worn jeans. 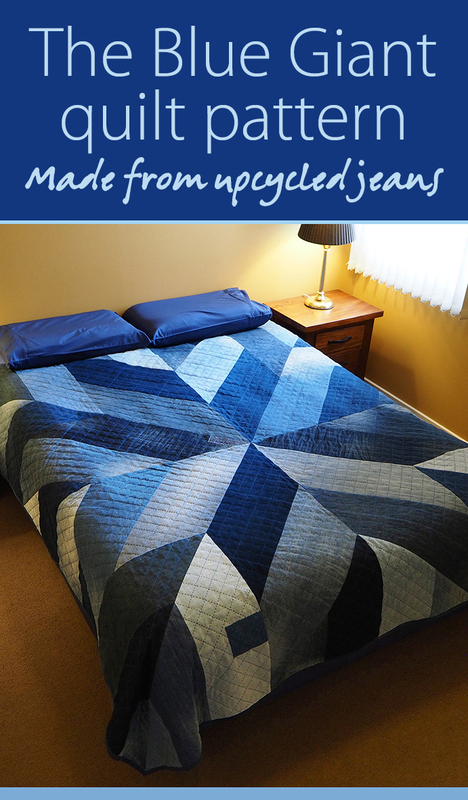 Blue Giant quilt pattern, made from upcycled jeans. I just can't imagine that machine-quilting would have suited it as well. 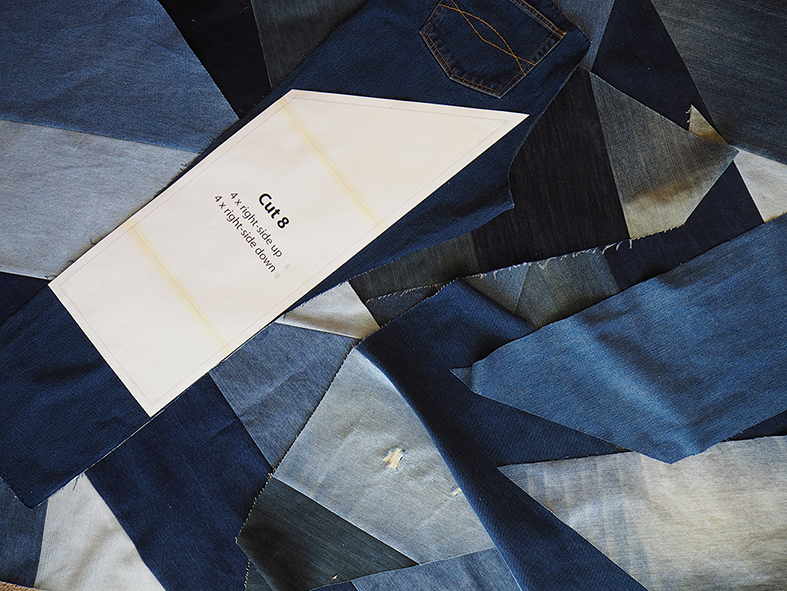 The quilt front is made entirely from upcycled jeans collected from friends and family or bought at the local op-shop. I'm making a real effort to work with textiles that have enjoyed a previous life rather than buying into the whole cycle of new fabrics released each season. There were a few jean pieces I wanted to use for colour balance that were worn through, so I patched them to add extra interest. They could just as easily have been patched from behind boro-style and stitched over to create even more texture. Theoretically, you could make this quilt top from 12 pairs of jeans, and I've created a pattern over in my Etsy store so you can do just that. 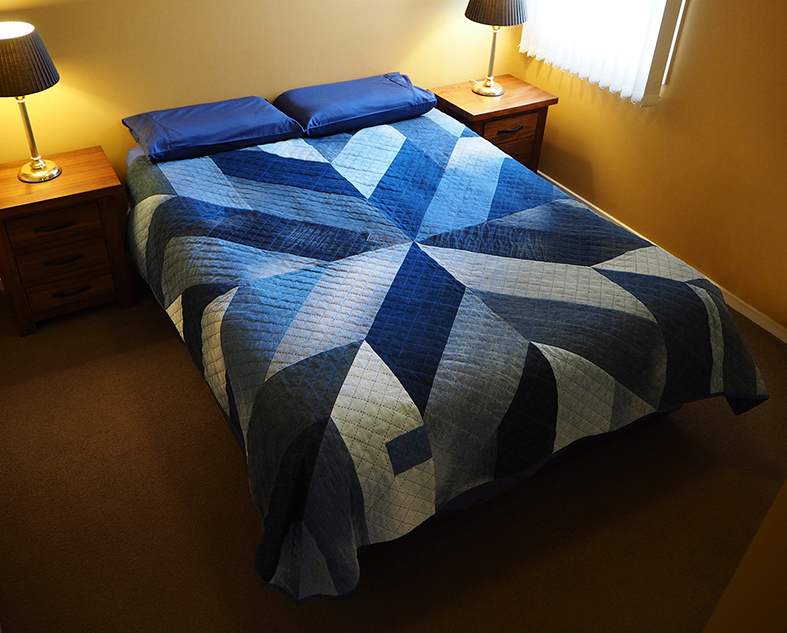 The quilt pictured here is 85" across (216 cm) and fits nicely on a queen-sized bed (pictured below). To get a quilt this size you need to use extra large men's jeans to make that centre star, but if you have a stash of old jeans and want to try this pattern out, I've provided instructions for you to be able to resize the pattern to suit whatever jeans you have handy. It's so exciting to finally be able to show you the finished quilt. For the last month or so it's been schlepping backwards and forwards with me from Melbourne to Sydney as I rearrange my life to accommodate more day job work. Luckily it was just about done when I arrived at my Mum's in Wagga (the halfway point when I drove between the two cities), as it was the perfect place to show it off from the back verandah. I hope everyone had a safe and happy break over the Christmas period. I'm looking forward to a 2017 filled with inspiration and more creative adventures. This is absolutely beautiful! I am wanting to do a QOV quilt for a veteran friend and spotted this one. Am thinking it could be done in red, white and blues. Will need to think about it. Thanks so much for sharing and for the pattern. What a lovely idea! If you end up making it I'd love to see it finished.